Megan Racing Front Roll Center Adjustment Kit is designed to raise front roll-center geometry by using aluminum spacer, while maintaining original bump-steer by using original tie rod ends. Altering front suspension geometry by raising the roll-center, results in extensive increase to roll resistance and important reduction of suspension compression of outside front wheel during cornering through enhanced weight transfer distribution. Throughout cornering, this leads to reduction of under steer through reduced front wheel firmness, as well as improved steering feel and accuracy and vehicle strength. 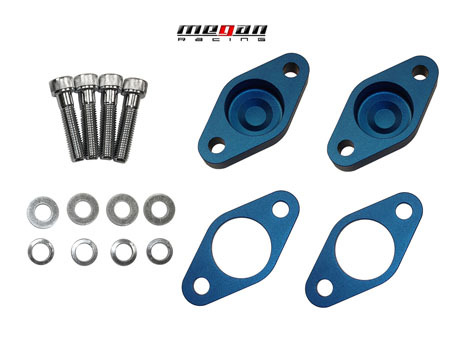 This kit Megan Racing Roll Center Adjustment kit only fits the 2002-2006 R50, R52, R53 MINI Cooper and Cooper S.
Kit comes complete as shown in picture. However, with the stock 17x7" wheels, there is almost no clearance between the ball joint stud and the inside of the wheel. It looks like it's touching, but so far has not scraped the wheel at all. Just eyeballing it, I would say the clearance is about 1mm.